This wide 15-inch colorful mat can protect your glass, wood, plastic, desktop table surface from scratches, stains and will provide a covering from falling food, especially when your kids eating they can't help not to mess with your beautiful dining table. It can be folded flat for easy storage and will never take too much space in your kitchen closet. For cleaning just wipe with damp cloth and it's good to be used again. 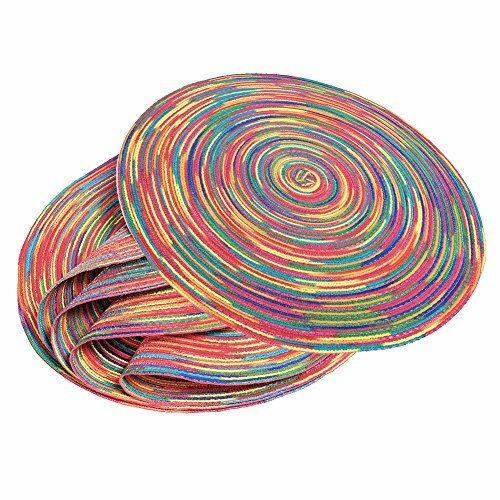 6 HIGH-QUALITY PLACE MATS - Your purchase includes 6 pcs round top quality woven braided placemats. They look elegant and can be used at home or in patio. Try it RISK-FREE now with our Money Back Guarantee. PROTECTS YOUR TABLE - These Place Mats protects your tabletop from hot plate marks, scratches and spill stain from food or drinking glasses. They are round and 15-inch total, large enough for any plate or bowl. ELEGANT DESIGNED - Our Place Mats are colorful and fit almost any kitchen or dining room decoration. Great for everyday use inside or outside. They are super easy to store, simply roll them and place them where you want too. THE PERFECT GIFT - These Place Mats is a great gift for your mom, dad, sibling, cousin or friend. Perfect for birthdays, Christmas, housewarming, graduation and much more. OUR PROMISE - We got you covered! Your purchase includes a hassle-free 30 days Money Back Guarantee. If you for any reason don't like your Brand-New Place Mats, simply return them for a FULL REFUND. No questions asked. If you have any questions about this product by DOZZZ, contact us by completing and submitting the form below. If you are looking for a specif part number, please include it with your message.